· create route interdependency and "blocking"
· use in conjunction with contact tracks for "feedback"
IB-Switch: Provides ultimate control for your switches, signals and more! The IB-Switch works in conjunction with your existing Intellibox and expands your ability to control your digital devices. Combining the functionality of 2 Marklin 6040 keyboards PLUS the Marklin 6043 Memory Unit, the IB-Switch provides a powerful, yet affordable way to add enjoyment and powerful features to your digital layout. 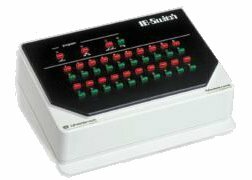 The IB-Switch connects to your Intellibox or IB-Control with a 6-wire telephone cable. Customized cable lengths are available. Briefly - From the start, you can see that the IB-Switch controls 20 different solenoid devices (switches or signals). By using the green key (rightmost key in the top row) allows you to "toggle" to a second group of 20 solenoids giving, in effect, access to 40 solenoids in all. 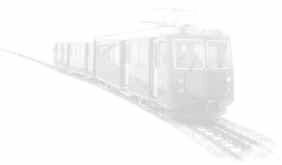 For example, you could have a single IB-Switch operate switches #1-20 and #21-40. In addition, you can also program up to 40 "routes", or combinations of solenoids. Each route can contain up to 20 different commands. Moreover, you can even program one route "call" (as a sub-route) another route. Finally, you can program the IB-Switch to have these pre-programmed routes triggered by contact tracks and feedback devices (like the Marklin 6088). You can even turn "on" and "off" this automatic routing whenever you want. The 27 page manual, written in clear English, makes it easy to understand all the features and functions available. Completely compatible with all your existing Hardware - Works with all makes of digital decoders (such as Marklin 6083's and 6084's) and detector modules (such as the Marklin 6088). The IB-Switch is the perfect addition to your existing Intellibox layout.